PROVO, Utah – Fifty-four team kills led No. 4 seed BYU to a dominating 3-0 match win (25-16, 25-21, 25-18) over in-state rival Utah on Saturday in the second round of the NCAA Tournament. With the victory, BYU (29-1) advanced to a seventh-straight Sweet 16 and extended a home match NCAA Tournament win streak to 19 games dating back to 1994. Senior Roni Jones-Perry contributed 20 kills on a .471 hit percentage while freshman Heather Gneiting had 12 kills hitting .688. Freshman Madelyn Robinson and junior Kennedy Eschenberg each had seven kills. Coming into the tournament as the top hitting team in the nation with a .318 average, the Cougars hit .410 as a team against the Utes (19-14). Senior Lyndie Haddock-Eppich notched 45 assists, eight digs and two aces while senior Danelle Stetler provided crucial defense with 12 digs. BYU came out swinging in the first set and took its first two points off of Jones-Perry kills on the outside. Utah took a slim 11-10 lead midway through the set, but BYU took off on a 7-0 run to jump ahead 17-11. The run included three kills by Jones-Perry and one by Eschenberg. A dump kill by Haddock-Eppich finished off the set, 25-16. BYU and Utah stayed within five points throughout the second set until back-to-back aces by Haddock-Eppich put the Cougars up, 16-10. The Utes brought the score within three at 18-15, but BYU maintained distance and finished off the set at 25-21. Utah began the third set with an ace, and took a 2-0 lead but BYU came back with an 8-0 run to pull ahead 9-3, including two kills each from Eschenberg and Jones-Perry. The Cougars maintained the lead, ultimately claiming the set and the match on a block by Haddock and Eschenberg, 25-18. The Cougars win came before a crowd of 5,183, the second-largest home crowd in program history behind the Utah game earlier this year. BYU will next play Florida on Friday, Dec. 7. No. 5 Texas and Michigan will play in the other Provo Regional game. The Cougars are hosting a regional for the first time since 1986 when the tournament had only 32 teams. Times and broadcast information will be announced Sunday afternoon. PROVO – Utah fell in the second round of the NCAA Tournament to the No. 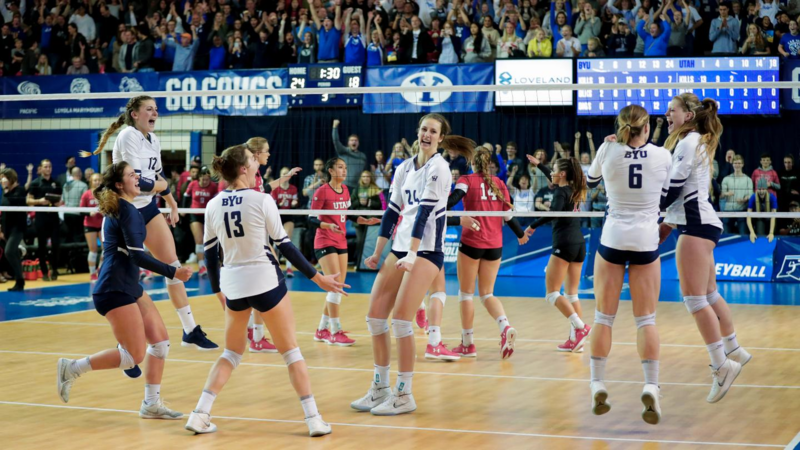 4 BYU Cougars in Smith Field House in straight sets (16-25, 21-25, 18-25) on Saturday, December 1. The Utes season comes to an end with a record of 19-14 overall. The team won six of its last seven matches coming into the match tonight against BYU. Dani Drews led the team with 13 kills hitting .345 on the night. Kenzie Koerber was right behind her with nine kills hitting .368. The Utes had a great start to the match jumping out to an 8-5 lead. BYU hung around though and eventually took the advantage using a 7-0 run to go up 17-11 that the Utes couldn’t recover from. The Cougars rode the home crowd to the first-set win. BYU took an early lead in the second, but Utah still hung around. Unfortunately, the Utes couldn’t get closer than three and BYU took a 2-0 lead after winning the second set. The Cougars took charge early in the third set building a 9-3 lead. Utah ran off a few points to try and tighten the set back up, but with the win in its grasp, BYU closed out the match. This was the first meeting between BYU and Utah in the NCAA Tournament. Bailey Choy led the team with 24 assists finishing off a great season. The junior setter eclipsed the 1,000-assist mark for the second straight season and led the team in aces with 48. She was two aces away from tying the single-season record for aces in a season. Brianna Doehrmann led the team in digs with eight.